I am working on the illustrations for a book. It is very exciting. (for me anyway) I needed some drunken pears. Also known as poached pears. So, of course, I called on über chef Ken Wyble, my brother-in-law. He called me a couple days ago and asked if I was ready for the pears and my answer? Sure why not. So we went out to his restaurant to shoot, just me and my assistant, Berry. 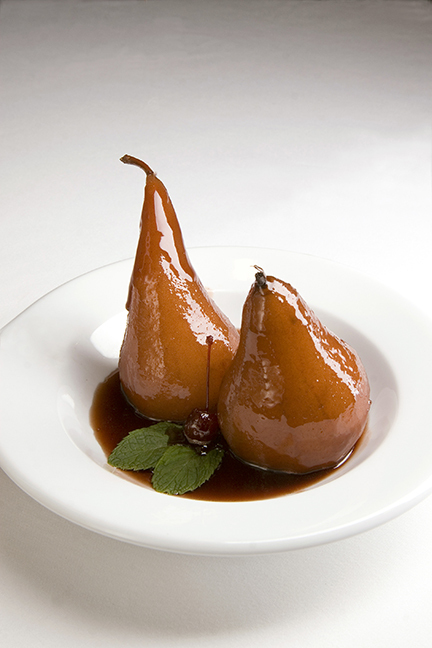 He made the most beautiful Bosque Pears poached in a pomegranate wine with maraschino cherries. They were beautiful, wonderful and in the end, oh so scrumptious. We made some more images for him of a couple dishes, some more desserts and had fun. This is one of the outs. PS: Click on the picture to see the true color. Dunno why but on this blog page they are a bit too brown.